The area under is curve is usually given between the curve and the x-axis. The curve may lie either above or below or both sides based on given values. To calculate the area under the curve, you should first divide it into smaller chunks and calculate one by one. Here, is given one example, how it can be presented graphically. First of all, choose data points over the x-axis under the curve and list then in the sequence. Make sure that first and last data point is plotted correctly on the x-axis. Now list the data points on the y-axis. If you don’t have any formula then you can choose the data points based on assumptions as well. Now plot all the data points one by one to make a graph on the axis. 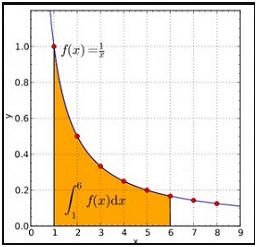 To find the area under the curve, it is suggested that keep the increments for x-axis as small as possible. It will not only improve the approximation but the accuracy of the area under the curve. In other words, a greater number of data points means more accurate the results as required by professionals. In the last, sum of data point for both axis and their average will be taken as the final area under the curve. The concept may sound little bit complicated but you can achieve the right outcome with continuous practice. Question 1: Calculate the area under the curve of a function, f(x) = 7- x2, the limit is given as x = -1 to 2 ?